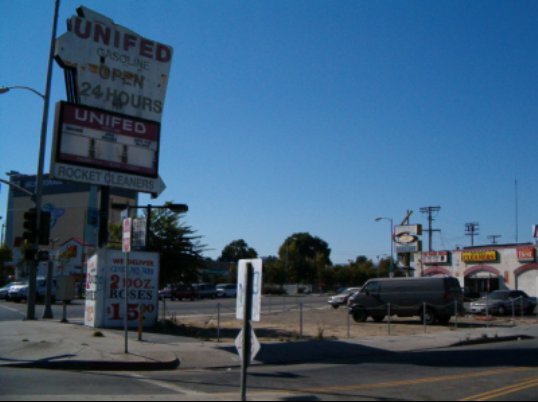 Here are some photos of the old sign I captured last weekend (7-24-2004). downtown Los Angeles in what was once an industrial corridor. it was "$WISE" or "Dollarwise Gasoline" as the phonebook listing had it. but definitely an ancient station. Only one of its kind so far as I know. 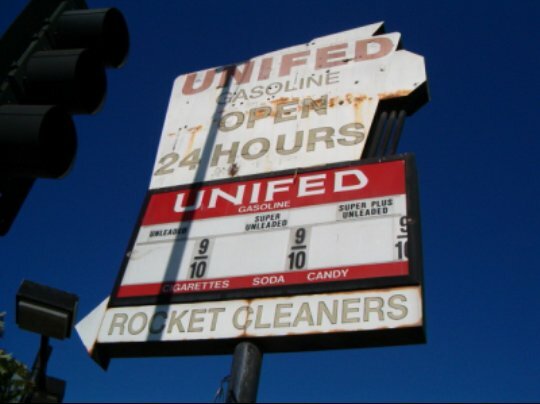 created his own gasoline brand by changing just one letter on the sign, to UNIFED. the station closed and a strip mall was built in the larger part of the triangle. However, the spot where the bays were remains dirt; why? polluted underneath? and in rather good condition too! Looking eastward; a light pole is casting the shadow. Looking westward (into the sun), you can get an idea of the triangular lot. 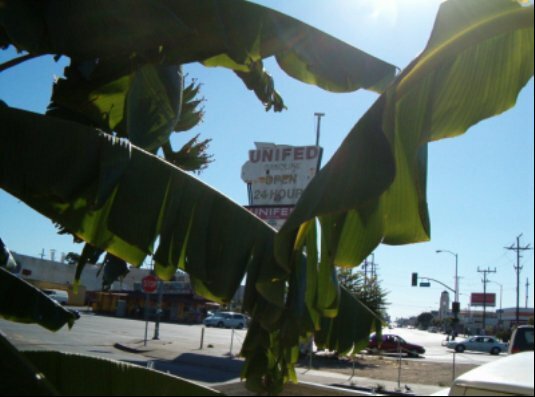 A view of the sign looking westward through the banana trees! bar across it, looks really odd. Almost like "KEYSTONE." An old RIO GRANDE site? midgrade came on the scene. Anyone recognize the sign from some earlier 50's or 60's brand? J. Eric Freedner, August 1, 2004. Gassigns Note: All photos taken by J. Eric Freedner on July 24, 2004.